Attention all hikers!! 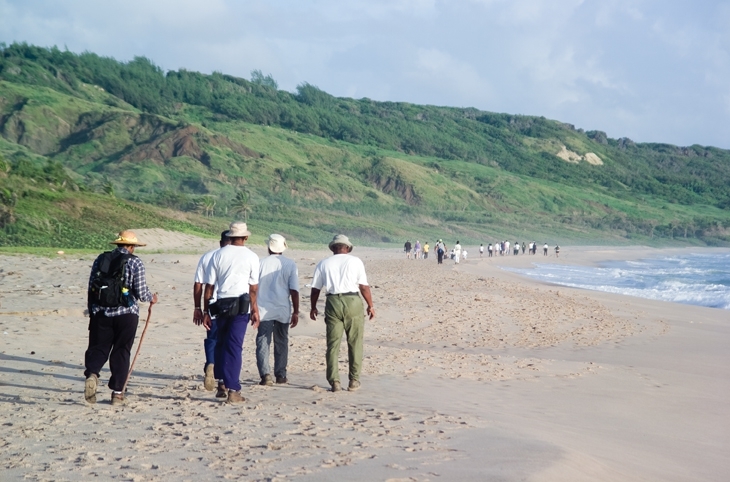 Join the Barbados National Trust hikes every Sunday from January to December each year. There is a morning and afternoon hike each Sunday to choose from. The first begins at 6am and the second at 3:30pm. The morning hikes consist of four grades of hikes: “Stop ‘n Stare” (c.6 miles) “1 Medium and a Fast Medium”(c.9 miles) “Grin ‘n Bear” (c.12 miles) In the afternoon, the morning’s “Stop ‘n Stare” route is repeated in one large group. Hikes last for 3 hours. Morning and afternoon hikes take place every Sunday EXCEPT on the Sunday of the Great Train Hike or unless indicated otherwise. Special Moonlight Hikes during the week begin at 6pm and the regular Sunday Moonlight Hikes begin at 5:30 p.m. Make sure you have strong footwear and a hat and always take a bottle of water and a snack if you wish. Refreshments are usually on sale after the hikes. A torch/flashlight is needed for the Moonlight Hikes. Call The Barbados National Trust at (246) 426-2421 for locations of the NOVEMBER hikes as they were unconfirmed at time of posting.